One of the random snacks that I enjoyed as a kid was a soft pretzel which you put in the microwave for 30 seconds. They come frozen. You get six in a box, as well as a bag of pretzel salt which is a bit thicker than regular table salt. I think you are supposed to wet the pretzel a bit to help it stick. (The most amusing thing is the warning not to use the entire salt packet for one pretzel, as it’s enough for six.) But I just dump a bit of table salt on a plate and duck a bit of pretzel into it. Sometimes I dunk the pretzel in mustard. I had mentioned to Marco a few weeks ago that I had found these things again. 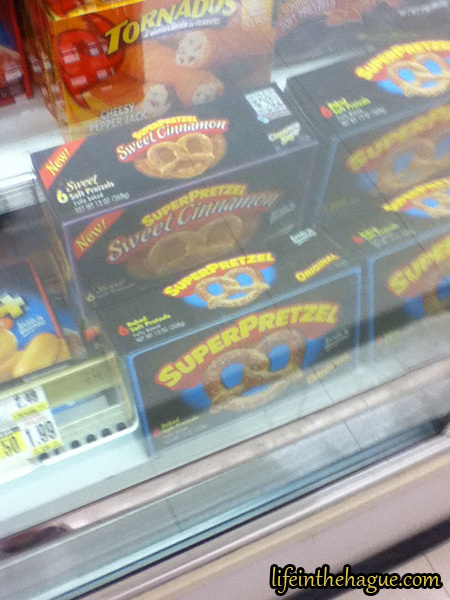 Recently he mentioned wanting to try them with cinnamon, which I thought was… interesting. I really couldn’t envision it. Well, I forgot that I live in America. If you want a flavor, they’ve probably already thought of it and manufactured it for you. I like the mustard pretzels , taste good. That sounds REALLY good! 🙂 Yum.